The Kansas Real Estate Salesperson Exam is split into two parts. The first part is the real estate salesperson national exam and the second part is the real estate salesperson state specific exam. 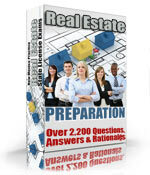 The national portion of the Kansas Real Estate salesperson exam is comprised of 80 questions. In order to pass the exam an examinee must answer 56 out of the 80 questions correct to pass (70% correct). The time limit allowed to complete the Real Estate Salesperson National Portion is 2.5 hours. The state specific part of the Kansas Real Estate Salesperson Exam is comprised of 30 questions and an examinee must answer 21 questions correct to pass (70% correct). The time limit allowed for the state specific part of the Kansas Real Estate Salesperson Exam is 1.5 hours. Real Estate Salesperson Exams in Kansas are administered by PSI exams at www.psiexams.com. Before registering with PSI for the Kansas Real Estate Salesperson Exam you must first be 18 years old and complete the education requirements. After registering for the Kansas Real Estate Salesperson exam you must take and pass both exams as well as apply for a license within 6 months. For more information on the registration and application procedures follow this link below. The Kansas Real Estate Salesperson Exams are taken by computer and you will receive your results immediately after finishing the exam. The exam is closed book. Be sure to arrive to the exam site 30 minutes before the scheduled start time of the exam. Remember to bring 2 forms of ID, your reservation confirmation number, a simple functioning calculator, and any education certificates required. Be sure to thoroughly review the candidate handbook for a complete list. The registration fee to take the Kansas Real Estate Salesperson Exam is 75 dollars.